It’s rare to catch a glimpse of a snow cone in New York City — except for maybe when the circus is in town. But Daniel Levin started changing that last summer when he sold his housemade snocones (as he spells it) at the now-shuttered Blackbird Parlor. 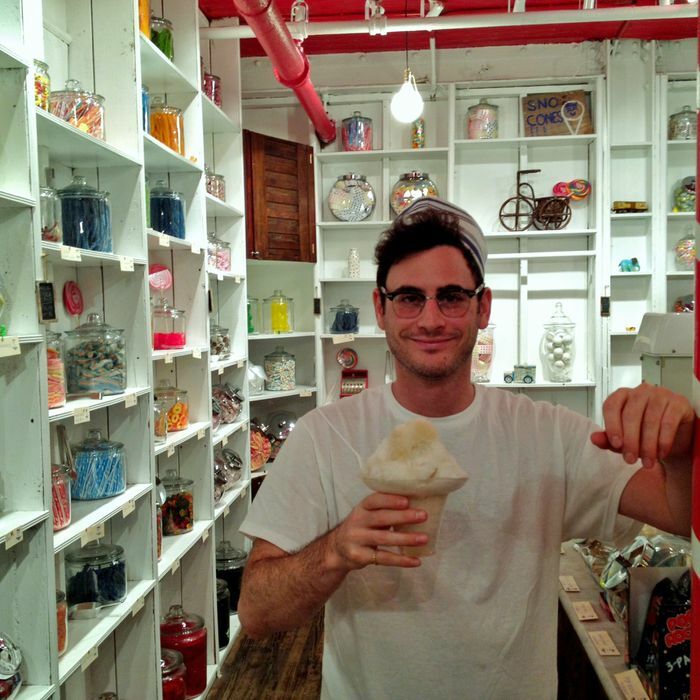 Now he’s opening an artisanal snocone and sweets shop, Handsome Dan’s Stand, in Williamsburg’s Mini Mall. The shop, which is soft-opening this week, sells snocones in grown-up flavors like thyme dream, earl grey cream, orange blossom ginger, rose pomegranate, and chili passion fruit. The housemade syrups double as flavors for sodas that will be available starting next week; lavender lemonade and egg creams round out the seasonal drink menu. The tiny shop, which has a candy-cane-striped pipe in the middle of it, is stocked with around 100 nostalgic candies, including Ring Pops and Pixy Stix for the kids of the eighties and Mallo Cups for the baby boomers, says Levin. While the inspiration for the shop came from his childhood, Levin assures us these snocones are made with natural ingredients, so they’re not likely to dye your tongue blue. Hours are noon to 10 p.m weekdays and noon to 11 p.m on weekends.